A summary of Sheffield’s market history, adapted from research conducted by Debra Mayor. On 26th February 1296, Edward I granted a Market Charter to Thomas de Furnival Lord of Manor of Sheffield. This allowed a market on Tuesdays and a three day fair once a year. The Charter was passed down to the Dukes of Norfolk and remained with them until 1899, when the 15th Duke sold the rights to the Sheffield council at a cost of £526,000. Between 1499 and 1786, Sheffield had a Market Cross which stood at the top of what is now Angel Street. The cross marked an area where farmers’ wives sold eggs, butter and grain from baskets. An Irish cross stood at the top of Snig Hill, and was probably where people from outside Sheffield were allowed to sell their goods. In the eighteenth century, the 11th Duke of Norfolk was petitioned by the local people to build a larger market place with better access and facilities, as the existing area was becoming overcrowded. Since then, a number of markets have been built in Sheffield. Fitzalan Market (named after the 11th Duke of Norfolk) was built on the site of the old medieval market cross in 1786 at a cost of approximately £4000. The plans and designs were drawn up by Joseph Hodginson at a cost of £10.10s. The market opened on 31st August. It was 300 feet long and 90 feet wide with 40 shops and 36 stalls, selling meat, fish, vegetables, fruit, poultry and all manner of other goods. It was redesigned in 1856, with a new elaborate cast iron canopy on the Commercial Street side to shelter customers and passengers waiting for carriages and the trollybus (tram). The Post office and Telegraph office was in the rear of the building, and the Duke collected tolls from the traders twice per year September and March. It stood for an amazing 144 years before being demolished. When it was in the process of being closed down, traders were moved to the new markets of Castlefoulds and the Slaughterhouses, alongside the River Don. C&A Modes was built on the site in 1932. Burtons Men’s clothing store had part of the area at the top end of Angel Street. This only lasted 8 years before being bombed in the Blitz. C&A re-built the whole site, which later became Primark. Built in 1827 by the 13th Duke of Norfolk, Henry Charles Howard, this market was adjacent to the River Don, below the Victoria Railway Station. The 13th Duke also constructed a bridge over the river to provide easy access to the Wicker when transferring livestock from the railway. 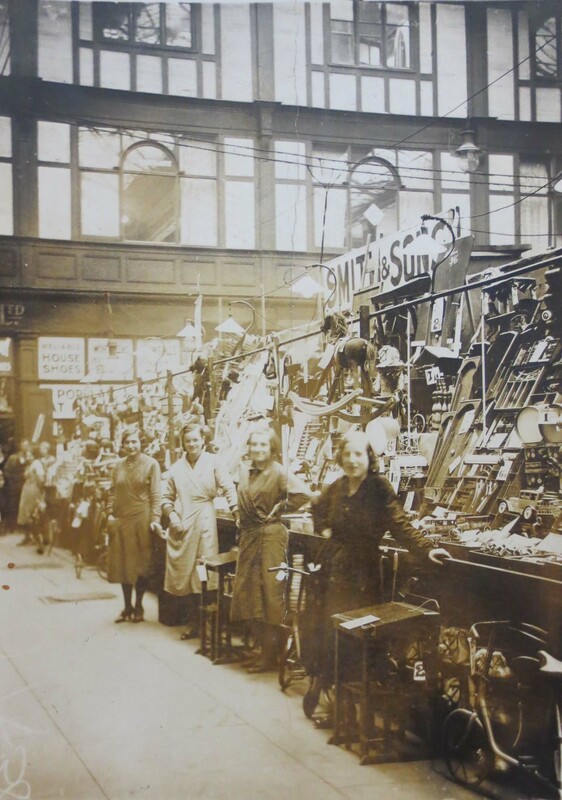 Smithfield was an open air market, which sold horses, asses, mules, cattle, sheep, lambs, pigs, calves, goats, geese, ducks, haystraw, fodder, turnips and other roots, nursery plants, old iron, carts, harnesses, tarpaulin sacks and hardware. It stood within area covering approximately 13,457 square yards. In addition, there were 12 arches under Victoria Station covering a further 2,000 square yards. A one week pleasure fair was held on the site at Whitsuntide, while another ran from Christmas Eve to New Year. The fair had a holiday atmosphere, with fairground organs, and roundabouts with highly decorated wooden horses named after well known racehorses. A performer named Captain Clarence entertained the crowds with sword and lance play, slicing a melon on his assistant’s neck. Another performer, Thomas Payn, had a large tent in which, for tuppence, moving pictures could be viewed with use of a bioscope. There were boxing booths, a “cake walk”, two giant steam swingboats called “The Shamrock”, and stalls selling sweets, food and drinks. 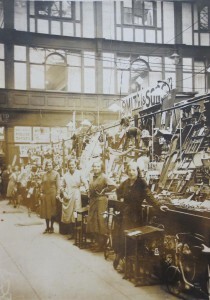 The last fair was held in 1940, after which the Smithfield closed and the area ceased to be used. Castlefoulds Wholesale was built in 1847 for the wholesale trade of fruit and vegetables twice per week, on Tuesday and Saturday. It stood as a dark covered building on an area covering 5,040 square yards. Sheaf ‘Open Air’ Market was built in 1880, incorporating the Corporation Gas Company property. Broad Street ran between the two markets, with Shude Hill beside the Sheaf and Exchange Street along the bottom of both. The wholesale fish market was also incorporated into the Sheaf market. The Sheaf occupied 6,057 square yards, in the centre of which there was a large fountain with a lion, where sellers traded in the open air. Customers could buy fruit, vegetables, flowers, plants, second-hand clothes, crockery, tapes, cottons and quack medicines. In the spring, the Sheaf market was full of plants and flowers from the allotment growers. Live poultry and other animals were also sold here. Tenants were transferred to this market from the Fitzalan Market which closed on 24th April 1930 and trading began the next day. The 1930s saw the two markets merged to become one large wholesale market, with Broad Street closed to provide much needed trading space. A cast iron and glass roof was placed over the whole area. It gave better transport facilities for traders and shoppers, including an extra 3,560 square yards for the fruit and vegetable traders 620 square yards for fish traders, 420 square yards for growers and 2,683 square yards for parking. There was also provision for lavatories, banana rooms, attendants’ offices, fruit and veg sorting, fish box washing, and refuse from both markets. Opened in 1879 by the 15th Duke of Norfolk, the fish market covered an area approximately 727 square feet, partly within a building that formed part of the Sheffield Gas Company. It contained a letting area of 613 square yards occupied by 18 stands inside and 5 outside. The road through the market was only 15 feet wide – quite inadequate for traffic purposes. Despite its name, the market also sold poultry and game. Demand for stands was great, with some traders forced to set up nearby outside the building. The market was able to take advantage of the new rail links from Grimsby, and thus acted as a hub through which produce could be redistributed to other markets in the West Riding and Lancashire. The market was demolished in 1961. The Corn Exchange was built on the site of the Shewsbury Hospital in 1881 by the Duke of Norfolk. Costing approximately £55,000, it had a large central hall, outside shops plus suites and offices and extensive cellaring. The hall was 150 feet long and 75 feet wide, and the roof made of Austrian oak. A market was held every Tuesday for the sale of corn and other grains, agricultural implements, seeds and artificial manures by sample. It was later used as the Labour Exchange, and although gutted by fire in 1947, the shops continued to trade until 1964 when the building was demolished. The Norfolk Market Hall was built in 1851 on the site of the Tontine Coaching Inn, which the Duke of Norfolk purchased for £8,000. It opened for business on Christmas Eve that year. Built in a Tuscan style of brick with stone basements, quoins and dressings, the hall was 296 feet long and 115 feet wide and 45 feet high in the centre. There were six large entrance gates two at each end and one at each side. The gates were handsomely ornamented with metal castings, and the roof was made of iron and glass, giving a light appearance. In the centre of the building there was a fountain made from green moonstone in an Italian design. The market accommodated 45 shops and 56 stalls in four rows in double range (back to back). The market sold a variety of wares from fruit and vegetables to general household goods. The Norfolk Market Hall was closed on 30th June 1959, when part of the Castle Market was opened in order to take the traders. Woolworths was built on the site in 1961 and this later became Wilkinsons.